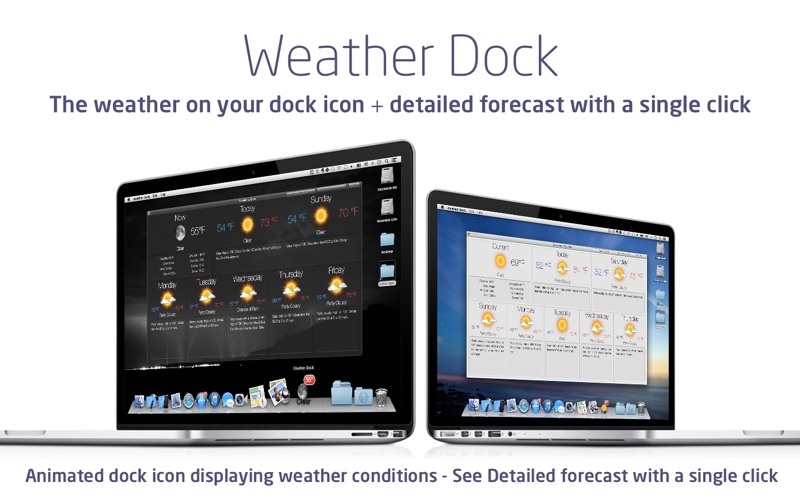 Weather Dock puts the weather right on your desktop. 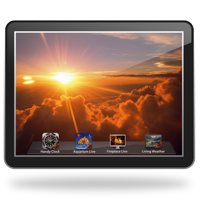 With a glance at the dock icon, you can see the current weather conditions, today's or tomorrow's forecast. With a single click you can access detailed current conditions and 7-day weather forecast. Detailed weather forecast: • Access the detailed current conditions and 7-day weather forecast window with a single click • Detailed 3-day two hourly forecast • Multiple forecast location support • Forecast window has animated icons • Imperial or Metric units • Weather updates every 60 minutes. • Updates Weather automatically if update was missed due to sleep or lack of internet connection Animated Customizable Dock Icon: • Icon badge shows: Current temp, wind or feels like temp or today's/tomorrow's min/max temp • Displayed weather can be: Current Conditions, Today's or Tomorrow's forecast • Weather Conditions text color: Black, White or White with Gray background • Adjustable animation speed (can be turned off) Very accurate weather information supplied by The Weather Company. If you experience any issues please contact us directly using the "Contact Us" button/menu item and specify your forecast location. I liked the app, but in the morning when I view the Wx screen, the temps (red and blue-ish) just don't show up well. The dock shows nicely (sun icon and temp), but the screen itself can't be adjusted for size or color and (therefore) better readability. I hope this changes or even better, I missed something. 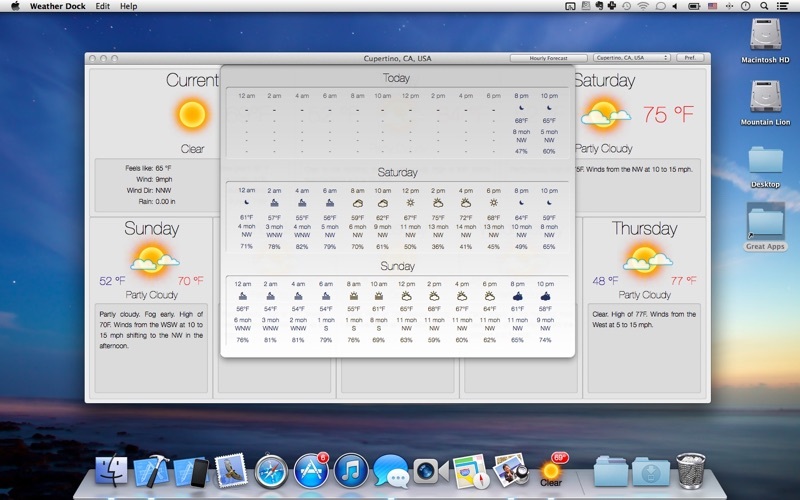 Love when I open my Mac the weather is there. I known what is the temp and current conditions. 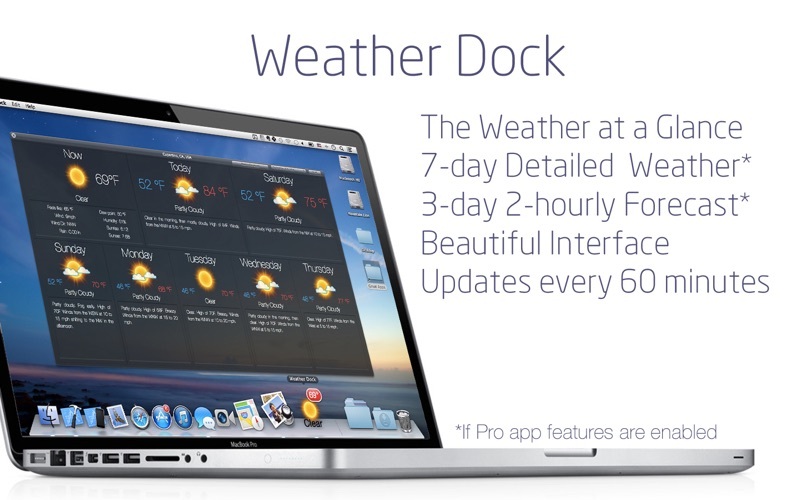 This is a fantastic mini-app on the dock which when clicked gives a pictorial view of four days of weather. The dock icon updates throughout the day and it is accurate with my home’s digital and analog thermometers. There seems to be no downside to installing and viewing this app. Great app, use it all the time to plan activities on Oahu (where I live). Also, essential for trip planning. Finally, you can save numerous locations and I like to check the weather at places where we have visited and places where our children live. This is short. Only four stars because I would like this on my Dashboaard. 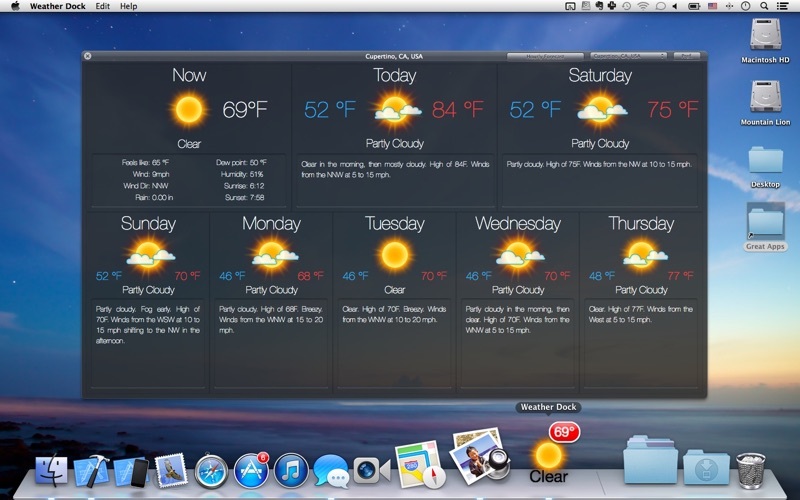 Great other than my desire for Dashboard widget. Once it was downloaded,all I had to do was look at the bottom of my screen and there it is. No muss, no fuss. Really like it better than what came on my Mac! I downloaded this app when the one I had on my desktop inexplicably stopped working. Nice design, and gives more information than my previous app. I’m happy! Just started using this app, Nice to see the temperature in my dock without having to open an additinal window! I just wish it had a radar aspect embedded into it. Then it would be great. I open the program, check the weather and then close it, so internet or power issues are a non-issue for me. Learn the various clicks and the UI is good. Again, add a Radar view for local zip and its great. It's ok but accurate. Not as dependable as I would like it to be. I use it at least daily. Would be nice if it could be made to stay on the desk top. 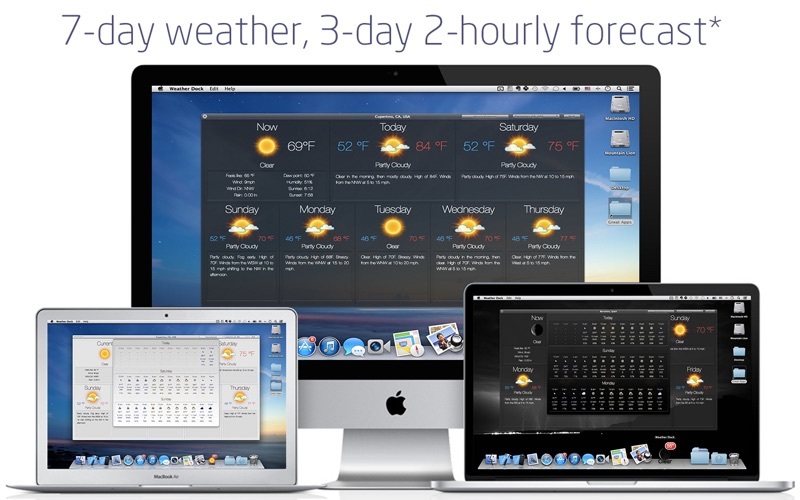 The second I turn on my Mac, I know the weather. Great app for weekly weather updates! I like everythig about the app. I've started launching it only when I need weather iformation. I don't let it run in the background anynore because it's power hungry. I ike the weather being easily accessed to when its right there on the dock. even it jumping up and down, its hard to ignore but it is good to check just in case if there's a storm that is brewing near your location. Nice app and I like the design too! I love the app so far. What I have not had a chance to research is that amount of resources the app uses. I like the animation, the live updates and the over-all app. I will give it a 5 for now but will rate it lower if it starts to drain my resources when I start using my mac for more intensive things. ...not just in the dock. Very good app with user friendly UI. Has not been working properly with OS Mojave for some time now. Apparently they have no intention of addressing the issue. Worked great prior to upgrade. I give this application a 5 star rating because it contains everything I need. The free version is a nice, but no better than okay, convenience. To be really useful would require paying $$$ and I am disinclined to do that for info I can just as easily acquire from the internet. The ads are bothersome, but not as intrusive as some other 'free" apps. Not as good as weather channel app but at least doable. I use this App daily. It's my "go to" App in the morning. I love that I can list all my kids and friends weather. It is a quick overview of all my family and I feel closer to them due vicariously living through their weather reports. I have tried a couple but this one is the best! Very subtle and very informative, dont leave home without it. Much better than the guys on TV. It is pretty with the colors and graphics, but would like to easily switch to other locations and back again without having to enter zipcodes, etc. An hourly feature would also be nice. Love having the temperature on my dock. It lets me see the temperature by the hour. pretty cool app for macOS, small app just on the bottom eaisly visible. A nice presentation of my local weather with just a click. The red font for current temperature is difficult for people with various eye impairents to separate from the background. A more contrasting color would be helpful. I believe you can get more contrast without with a subtle change. For older folks, a bit larger type in ome areas would help. Nice program. I hav enjoyed this app with its colorful display of important weather information. You can check on weather in any part of the country. I have not tried foreign weather reports. I can hihgly recommend this app. It's convenient and is always up to date. Love the design. I upgraded to the pro version and like the way it gives me more days The way is shows the clud, rain and sunshine is awesone. The graphics are behond awesome. If I could figure a way to move it from the dock to the menu bar it would get that coveted fifth star.